Posted April 1st, 2010 at 4:05 pm. 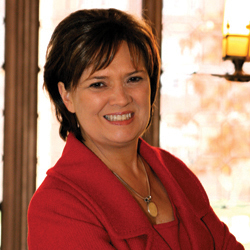 Lynne Pasquerella, president-elect of Mt. Holyoke College, will give the 2010 Bernard Rothenberg Lecture in Biology and Public Policy at 4 p.m. on Thursday, April 8, in the Ely Room of the Wyndham Alumnae House. Pasquerella is also a global advocate for women’s education and empowerment. She is the principal investigator on a $3.5 million grant from the National Science Foundation promoting careers for women in science, technology, engineering, and math, and serves on the board of the Africa Center for Engineering Social Solutions, which focuses on empowering women in an AIDS-ravaged section of Kenya. The Bernard K. Rothenberg Fund was established by Miriam Korn Rothenberg ’45 in memory of her husband in 1994. The Bernard Rothenberg lectureship brings distinguished individuals whose work has had an impact in the area of biology and public policy to the Bryn Mawr campus for a day. Previous lecturers include Donald Kennedy, Joshua Lederberg, Arthur Caplan, Maxine Singer, Gina Kolata, and Shirley Tilghman.